OFI Global Asset Management, Inc. Item 1. Reports to Stockholders. Performance data quoted represents past performance, which does not guarantee future results. The investment return and principal value of an investment in the Fund will fluctuate so that an investor’s shares, when redeemed, may be worth more or less than their original cost. Fund returns include changes in share price, reinvested distributions, and a 4.75% maximum applicable sales charge except where “without sales charge” is indicated. Current performance may be lower or higher than the performance quoted. Returns do not consider capital gains or income taxes on an individual’s investment. Returns for periods of less than one year are cumulative and not annualized. For performance data current to the most recent month-end, visit oppenheimerfunds.com or call 1.800.CALL OPP (225.5677). See Fund prospectuses and summary prospectuses for more information on share classes and sales charges. The Fund’s Class A shares (without sales charge) produced a return of 4.45% during the reporting period, outperforming the 0.07% return provided by the Bloomberg Barclays U.S. Aggregate Bond Index (the “Index”). addition, EM local assets reversed most of the losses they experienced in the months after the Presidential election, and rallied year to date in 2017. Europe and parts of Asia. Latin America is a different story, with growth more challenged overall, except for Brazil. In the U.S., while devastating hurricanes swept through the country during the period, gross domestic product (GDP) remained on its 2% growth trend through the end of the reporting period. In the short term, severe storms typically reduce economic activity but then lead to rebuilding in later months. The medium-term course of the economy should not be affected, in our view. Private consumption, the driving force of the economy in recent years, is growing at a moderate rate. Additionally, business fixed investment has gained momentum in recent months, and headwinds from international trade turned into tailwinds as lagged effects of past dollar strength diminishes. In fact, dollar weakness typically leads to global growth momentum gains. International economic and geopolitical concerns were somewhat elevated in the closing months of the period, with tensions in North Korea and the Catalan independence referendum. The German election led to mixed results for Chancellor Merkel, with a complicated coalition-building process that is not expected to be resolved until the end of the year. Nevertheless, Merkel still calls the shots and, in cooperation with French President Macron, a modest reform agenda on Eurozone governance is expected in the coming year or two. Markets are keeping an eye on developments in North Korea, which remains unpredictable. With the U.S. expansion continuing, the Federal Reserve is near to reaching its dual mandates of full employment and price stability. While inflation has surprised to the downside for a few months now, the Fed sees it as temporary and has begun its balance sheet normalization program. The Fed continues to signal one more hike this year, likely in December, and three hikes next year. The market is increasingly pricing in a December hike, but not more than one hike for 2018. The reaction to balance sheet normalization and hikes has been orderly. For the one-year reporting period, the Fund’s strongest absolute results stemmed from its exposure to high yield, emerging market credit and senior loans as well as an underweight in duration. In High Yield, the Fund benefited most from its exposure to the energy sector. Oil prices rose over the closing months of the reporting period. The rise in oil prices was generally a result of improved fundamentals due to better than expected demand growth globally, lower OECD (Organization for Economic Co-operation and Development) countries’ oil inventories, and continued strong compliance with the OPEC (Organization of the Petroleum Exporting Countries) production cuts announced last year. In addition, sentiment improved as the working oil rig count flattened in the U.S. during the third quarter of 2017, which indicated that growth in U.S. oil shale drilling activity was moderating. The Fund also benefited from its exposure to Services and Gaming, Lodging and Leisure. Emerging market credit has outperformed U.S. and European markets so far in 2017. The Fund maintained an overall neutral position, but with a greater tilt toward higher-yielding credits, in particular state-owned oil & gas companies that have been repairing their credit profiles but offered a significant yield advantage over their government bonds. The main contributors to performance included Brazil and Ukraine. We increased our allocation to senior loans during the reporting period, which currently represent roughly 14% of the portfolio at period end. This exposure performed well during the reporting period, and we continue to believe the current market environment can be supportive of senior loans. Detractors from performance included the Fund’s exposure to catastrophe bonds that were affected by the hurricanes in Texas and Florida. fundamentals in High Yield have been improving modestly due to earnings growth and a lack of capital expenditures. Higher commodity prices, driven by rising demand, even in oil, have had a positive effect especially on High Yield and EM credits. Given our expectation that growth will stabilize around current levels, our outlook remains positive. Two potential headwinds to future returns are valuations that are rich relative to historical levels and any negative market response to changes in central bank policy. Valuations appearing somewhat rich at this point in the cycle are not unusual, especially when growth is positive and fundamentals are improving. With respect to central bank policy, the biggest unknown is who will be appointed the next Chairperson of the Federal Reserve. The Fed’s framework for normalizing the balance sheet and increasing policy rates is already laid out and we don’t expect significant changes, but the announcement of the new Chair is likely to produce at least a short-term response from the markets. MBS & CMBS position on any back up in spreads. Outside of the U.S., we like EM Local and Credit bonds based on robust growth combined with stable to falling inflation. * Represents a value of less than 0.05%. Portfolio holdings and allocations are subject to change. Percentages are as of September 30, 2017, and are based on the total market value of investments. Portfolio holdings and allocation are subject to change. Percentages are as of September 30, 2017, and are based on total market value of investments. conversion. Returns for periods of less than one year are cumulative and not annualized. See Fund prospectuses and summary prospectuses for more information on share classes and sales charges. Standardized yield is based on an SEC-standardized formula designed to approximate the Fund’s annualized hypothetical current income from securities less expenses for the 30-day period ended September 30, 2017 and that date’s maximum offering price (for Class A shares) or net asset value (for all other share classes). Each result is compounded semiannually and then annualized. Falling share prices will tend to artificially raise yields. The unsubsidized standardized yield is computed under an SEC-standardized formula based on net income earned for the 30-day period ended September 30, 2017. The calculation excludes any expense reimbursements and thus may result in a lower yield. 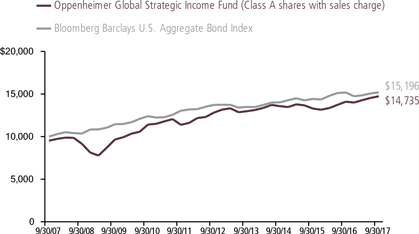 The Fund’s performance is compared to the performance of the Bloomberg Barclays U.S. Aggregate Bond Index, an index of U.S dollar-denominated, investment-grade U.S. corporate government and mortgage-backed securities. The Index is unmanaged and cannot be purchased directly by investors. While index comparisons may be useful to provide a benchmark for the Fund’s performance, it must be noted that the Fund’s investments are not limited to the investments comprising the index. Index performance includes reinvestment of income, but does not reflect transaction costs, fees, expenses or taxes. Index performance is shown for illustrative purposes only as a benchmark for the Fund’s performance, and does not predict or depict performance of the Fund. The Fund’s performance reflects the effects of the Fund’s business and operating expenses. The Fund’s investment strategy and focus can change over time. 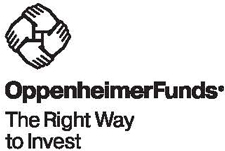 The mention of specific fund holdings does not constitute a recommendation by OppenheimerFunds, Inc. or its affiliates. Fund Expenses. As a shareholder of the Fund, you incur two types of costs: (1) transaction costs, which may include sales charges (loads) on purchase payments and/or contingent deferred sales charges on redemptions; and (2) ongoing costs, including management fees; distribution and service fees; and other Fund expenses. These examples are intended to help you understand your ongoing costs (in dollars) of investing in the Fund and to compare these costs with the ongoing costs of investing in other mutual funds. The examples are based on an investment of $1,000.00 invested at the beginning of the period and held for the entire 6-month period ended September 30, 2017. Actual Expenses. The first section of the table provides information about actual account values and actual expenses. You may use the information in this section for the class of shares you hold, together with the amount you invested, to estimate the expense that you paid over the period. Simply divide your account value by $1,000.00 (for example, an $8,600.00 account value divided by $1,000.00 = 8.60), then multiply the result by the number in the first section under the heading entitled “Expenses Paid During 6 Months Ended September 30, 2017” to estimate the expenses you paid on your account during this period. Hypothetical Example for Comparison Purposes. The second section of the table provides information about hypothetical account values and hypothetical expenses based on the Fund’s actual expense ratio for each class of shares, and an assumed rate of return of 5% per year for each class before expenses, which is not the Fund’s actual return. The hypothetical account values and expenses may not be used to estimate the actual ending account balance or expenses you paid for the period. You may use this information to compare the ongoing costs of investing in the Fund and other funds. To do so, compare this 5% hypothetical example for the class of shares you hold with the 5% hypothetical examples that appear in the shareholder reports of the other funds. Please note that the expenses shown in the table are meant to highlight your ongoing costs only and do not reflect any transactional costs, such as front-end or contingent deferred sales charges (loads). Therefore, the “hypothetical” section of the table is useful in comparing ongoing costs only, and will not help you determine the relative total costs of owning different funds. In addition, if these transactional costs were included, your costs would have been higher. The expense ratios reflect voluntary and/or contractual waivers and/or reimbursements of expenses by the Fund’s Manager and Transfer Agent. Some of these undertakings may be modified or terminated at any time, as indicated in the Fund’s prospectus. The “Consolidated Financial Highlights” tables in the Fund’s financial statements, included in this report, also show the gross expense ratios, without such waivers or reimbursements and reduction to custodian expenses, if applicable. Caesars Entertainment Resort Properties LLC, Sr. Sec. Clear Channel Communications, Inc., Extended Sr. Sec. Wachovia Capital Trust III, 5.57% [US0003M+93] Jr. Sub.